Infection like that could kill the bird. Take it to a vet for antibiotics. i do not know any vets is there anything i can do myself to treat him ? also some guy at a bird store told me he will be fine on his own like that is that true ? He might be fine on its own and then he might now. He does need antibiotics. 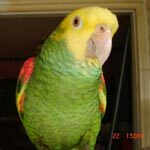 If you don't know of a vet that can sell you some, please go online and get a good wide spectrum antibiotic that you can put in the water [it will not harm the healthy one but, in all honesty, you should not have put a bird you don't know if it's sick or not with a healthy one]. You should have quarantined for a month. You could have put them in different rooms but let them be able to call to each other. Why are you not looking for its owner?